Today's outfit is my attempt at jumping onto the monochrome bandwagon, which is definitely one of the hottest trends right now. These awesome printed pants are from Glassons, but I actually won them from The Style Insider's blog competition, which I am super grateful for. 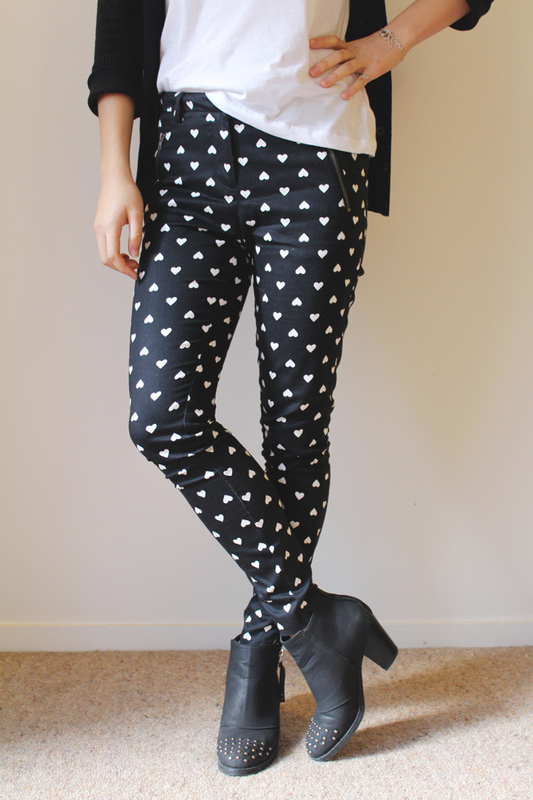 I had been thinking about purchasing them for a while because the heart print is just too adorable; plus it knocks out the printed pant and monochrome trend in one. I was also lucky that these are a 'cropped' length; as you can see, I'm slightly vertically challenged, so they're the perfect full length pant for me. Keeping the look casual, I paired it with a plain white t-shirt, comfy cardi and some little silver accessories. Of course, I had to wear my favourite black booties (also from Glassons!) to pull it all together. These are actually the first pair of real pants (i.e. not denim) that I've owned since I was about 10 years old. It's a very refreshing change from jeans; I think I'm going to have to expand my collection. 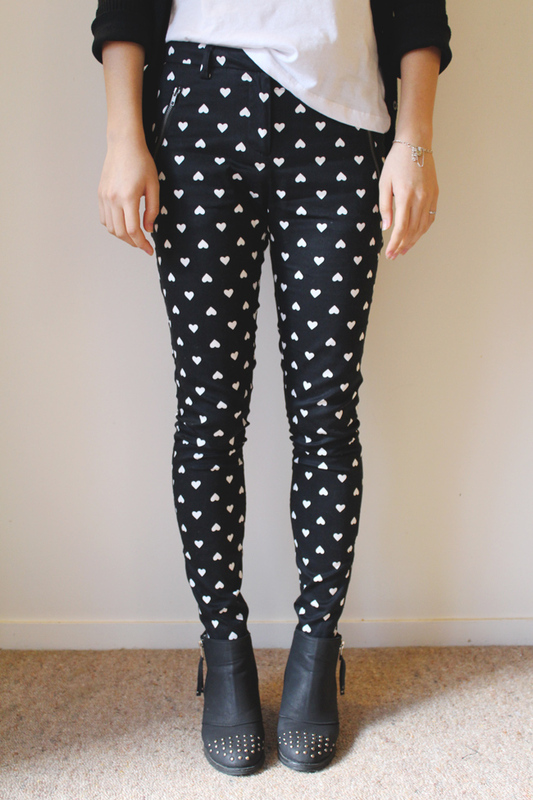 oh my gosh, these pants are way too cute! Love them - and your ankle booots are perfect! Need to buy myself a pair. Definitely think I'll be popping down to my local Glassons and purchasing a pair of these pants if they have any left! I have exams in two weeks too and it's terrifying haha! Happy winter!!!! I wish I could feel better the winter in Brazil! You look lovely with your pants! Thanks so much Kat, I love pairing these two pieces together! Your pants are so unique and special! 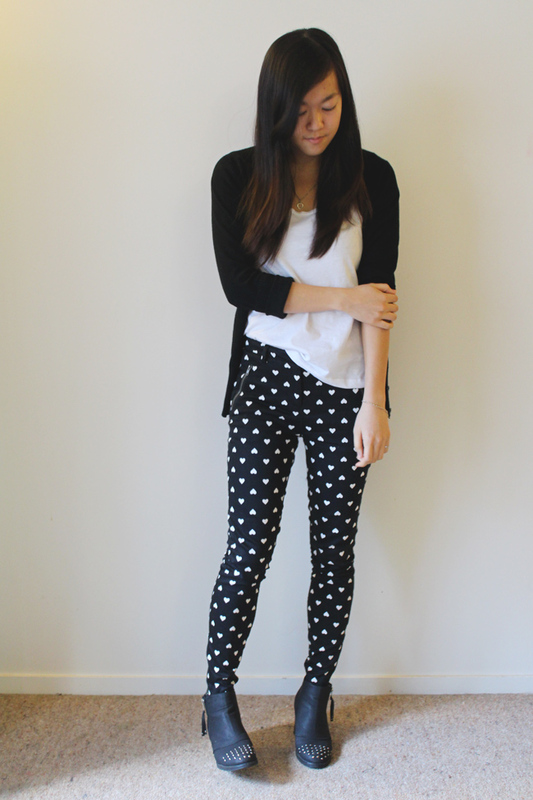 I love heart prints and you wear them SO well! Heart prints are so sweet, i love them too :) Thank you Sara! super cute babe. im a fan of printed pants and casual tees.